A few weeks ago I went to LifeCycle, an event hosted by Lakemac council. It was free, and in return for participating and being photographed and filmed, every rider had a set of spoke lights fitted to their bike. We then rode along the beautiful shared path alongside the lake. And we got to keep the lights, along with a set of clipon bike lights. These are a great night time visibility increaser, they look pretty and they also display a message as you ride! All in colourful lights! Mine are blue, but there were different coloured ones and some were rainbow coloured. I used my Bennett bike for the event as it’s been very under-utilised lately and I wanted to have more motivation to ride it. I still can’t work out what the message is as I ride along, the messages are programmed into the device and we were given a kit to change it. Using the lights is fun, it gives off lots of light and although it’s slightly distracting at first, I soon got used to it. The lights are activated by a small red button and they are deactivated when the wheels don’t turn for more than about a minute, there is a magnetised sensor on the fork for that purpose. While this is a great initiative of the council, a lot of resources were put into the event, it was organised by an external PR company, and I believe that a video for a safe cycling campaign is to be made from footage obtained from it. However, increasing the visibility of cyclists on the road at night and telling the public about it is no replacement for safer infrastructure. There was also not much information given out in advance of the event and I know of some people who were put off registering because of this. One thing I have learnt from organising three vintage rides is that the more information given out before an event the better. Cyclists do not want to go to something that is not suited to their fitness level or to the type of bike they take to it and new cyclists are very wary of doing something that may be beyond them in terms of fitness and riding skills generally. Riding in a tight group at night is a scary prospect for many, though it turned out that due to the pace we rode at there were no dangers in this regard. I think more people would have registered and turned up had more info been given beforehand. It was a fun event however, with music from a live brass band, good speeches and plenty of camaraderie among the cyclists. I ride most of the way with another woman and we had a great chat, this type of connection is what makes events such as this. A boat with cameras followed us along the edge of the Lake and all the way along the bike path, trees had been lit with coloured lights. The ride leader, a manager at Lakemac, took us along at a gentle pace and made a nice speech at the turnaround point. There was also a young rider with his mum who was a fair bit behind and a lot of encouragement was given to him. At the end of the ride he was clapped and cheered across the finish line, while the brass band played a special piece for him, a nice touch. 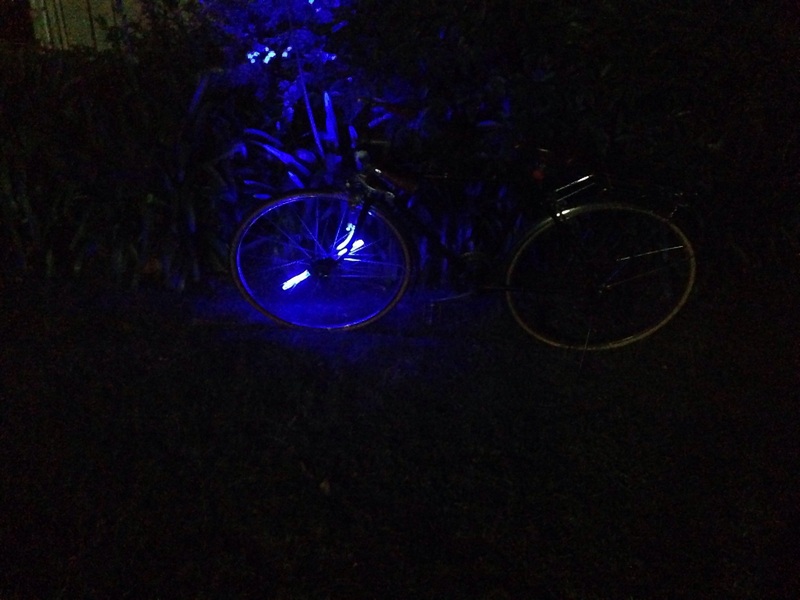 This entry was posted in Uncategorized and tagged Bennett, events, Lake Macquarie, newcastle bike tracks, night riding. Bookmark the permalink. I agree Vicki. I registered for this most worthy event (Lake Mac Council really always seem right on the money to me) but then couldn’t find out much beforehand about what we had to bring, aims of the ride etc. I (very wrongly!) assumed it was about healthy eating, lifestyles and bike riding. Yes the more info the better prior to events – always! Your bike lights sound lovely, I wonder what your flashing message is saying? I have tried standing the bike upside down and spinning the wheel as well as watching while someone else rides it and I still can’t work it out!